Set on the Côte de Lumière in the Vendée region, La Pomme de Pin is located just 200 metres a wide stretch of golden sand, which is lapped by crystal clear waters. 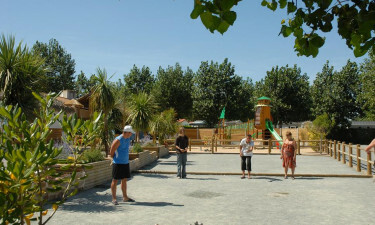 Let LuxCamp book this luxury camping site for you and you will enjoy the holiday of a lifetime. Guests can take an enchanting trip to visit the Island of Ye, which can be found just across the water from Le Pomme de Pin. The historical town of Saint Hilaire de Riez is also just a short stroll away and is just waiting to be discovered. Why choose La Pomme de Pin? Guests at La Pomme de Pin are treated to private beach access and this is the perfect place to spend time during a camping holiday. Guests are provided with sun loungers on the sand as well as special beach activities. 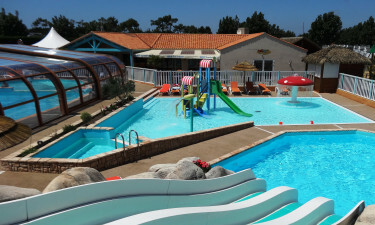 Keeping cool and having fun during your camping holiday is easy as La Pomme de Pin boasts a huge outdoor water park for guests to make use of. 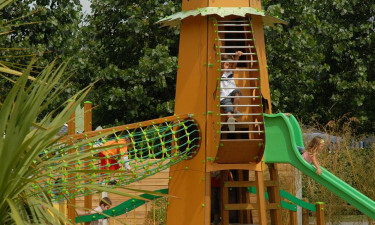 The huge looping waterslides are sure to appeal to guests of all ages.